LOULOU is a versatile short cardigan that can be worn with jeans for a sporty style or over a dress for a classy, feminine look. Stockinette stitch combined with interesting details make an addictive and quick knit. LOULOU is a timeless design that’s easy to wear and which will accompany you for many years. Bands of twisted ribbing follow the shoulder line down the sleeves to the cuffs with the rest of the cardigan worked in stockinette stitch. Corresponding twisted ribbing bands lead from each underarm along the sides of the body to the hem. The hem features k3, p1 ribbing with decorative eyelets at the top of the purl columns. 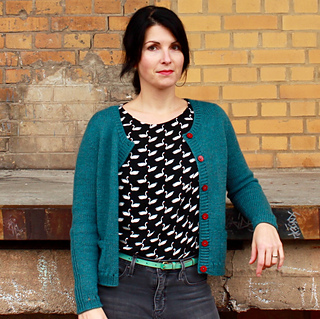 Small pockets give the cardigan an extra fun detail. The whole cardigan is worked seamlessly from the top down. The yoke is worked using a modified version of the contiguous set-in-sleeves method developed by Susie Myers. Once the yoke is complete, the sleeve stitches are put on hold and the body is knitted from the armholes to the hem in one piece. The sleeve stitches are then put back on the needles and worked in the round until the cuffs. At the end, stitches are picked up for the neckline and for the button bands. 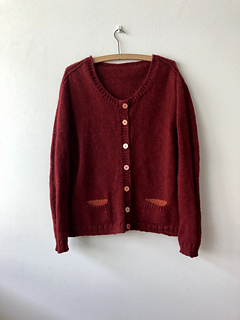 Since this is a top-down construction, it is advisable to try on your knitting from time to time to check the fit and the overall length of the garment. You can adjust the length or the number of decreases or increases to suit your own body type or preferences. Recommended to be worn with 5-10 cm / 2-4” positive ease. Sample shown is knitted in colorway Windermere.